Back in January of 2017 we did a Quick 10 with Nathan Compton from Lakewood, CA. When asked who his favorite player was he answered Rocco Grimaldi.For some reason that name stuck with me. Fast forward to January 28th 2018. 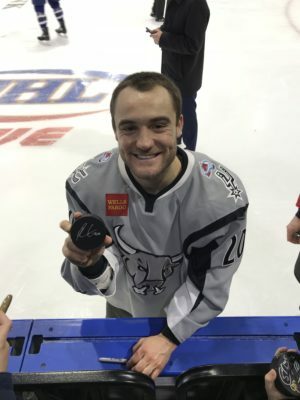 The AHL All-Star Classic is being held in Utica, NY and Rocco has be selected from the San Antonio Rampage to attend. At the skills completion Rocco participated in the Sher-Wood Puck Control Relay, CCM Fastest Skater and the Dunkin’ Donuts Breakaway Relay. After the events all the players stay and sign autographs for the fans. This is where I got an opportunity to speak with Rocco. I told him who I was, about our organization, about the Quick 10’s we do and how Nathan said he was his favorite hockey player. That was when Rocco asked if he could sign something for Nathan. Lucky for us a friend had an extra puck with them. 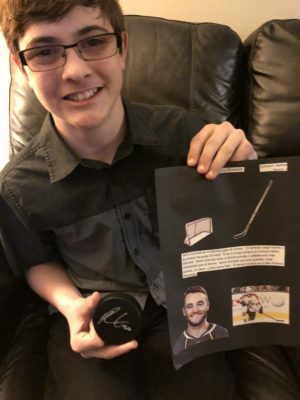 Nathan got the puck in the mail as he was doing a small project for Spanish class on his favorite athlete (I think you can guess who was the subject!). Thank you Rocco for the big assist on this one. You have put a smile on many faces!